<h2>Cosmic &#039;dustpedias&#039; could reveal new types of galaxy</h2><br /><p>Cosmic dust grains, which are born in stars, are the building blocks for other stars and rocky planets such as Earth – as well as maybe life itself. However, our understanding of the dusty universe and the processes that form it remains limited.</p> <p>‘We lack vital knowledge about the origin of cosmic dust, its evolution, and therefore the fuel for star formation of galaxies over recent cosmic history,’ said Professor Haley Gomez, an astrophysicist at Cardiff University in the UK.</p> <p>The cosmic haze also means that key astronomical processes evade detection by traditional telescopes. ‘Our view of the universe has been biased,’ said Prof. Gomez, who is undertaking a project called CosmicDust. ‘We’ve been looking at the visible light from stars and galaxies. But half of all the light shone by stars since the Big Bang has in fact been hidden.’</p> <p> <div class="quote-view quotesBlock quote_horizontal"> <div class="quotesTop"><img src="https://horizon-magazine.eu/sites/all/themes/horizon/images/quotes_top.png" alt="" title="" /></div> <p>‘We lack vital knowledge about the origin of cosmic dust, its evolution, and therefore the fuel for star formation of galaxies over recent cosmic history.’</p> <blockquote><p>Professor Haley Gomez, Cardiff University</p></blockquote> <div class="quotesBottom"><img src="https://horizon-magazine.eu/sites/all/themes/horizon/images/quotes_bottom.png" alt="" title="" /></div> </div> </p> <p>The problem is, cosmic dust is too cold to be detected by optical telescopes. In the past decade, however, dust exploration has been aided by major space missions, such as the Planck and Herschel missions launched in 2009.&nbsp;These have involved telescopes that can capture galaxies in the far-infrared part of the spectrum – where the dust particles become visible.</p> <p>Both missions finished in 2013, leaving behind a wealth of raw data to delve into. This is being harnessed by <a href="http://dustpedia.com/" target="_blank" rel="noopener noreferrer">DustPedia</a>, one of a couple of&nbsp;Cardiff University projects seeking to better understand the properties of space dust.</p> <p><strong>Data bank</strong></p> <p>DustPedia is combining the Herschel and Planck data with that from ground-based and space-based telescopes – and from other parts of the spectrum, such as the visible and ultraviolet – to create a huge archive for studying dust and its interactions in galaxies in the part of the universe nearest to us. It currently provides imagery for nearly 900 galaxies.</p> <p>‘One of the prime motivations in doing this is to understand how galaxies are evolving and changing with time,’ said Professor Jonathan Davies, principal investigator of DustPedia. He explained that, for instance, a large portion of chemical elements synthesised by stars reside in cosmic dust. 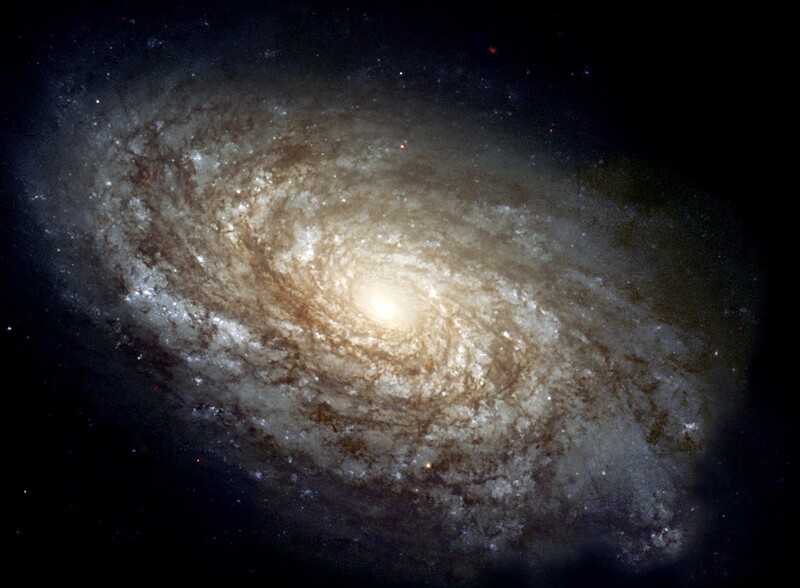 Understanding how much of each of these is present helps reveal how chemically evolved a galaxy is, and ultimately how far it has proceeded along its life path.</p> <p>This can also help us compare how different types of galaxies are evolving – for instance, the differences between giant elliptical galaxies and smaller flattened ones.</p> <p>Prof. Davies describes cosmic dust as being like cigarette smoke blown in front of a light bulb, obscuring much of the light from stars.</p> <p>‘You might be misled into thinking that if a galaxy is not producing much light, there can’t be many stars there. If you can measure the quantity of dust, you can start making corrections,’ he said.</p> <p>Prof. Gomez’s CosmicDust project is seeking to build an extensive catalogue of dusty galaxies to create a ‘census of dust’ aided by the insights from Herschel. She expects this will help uncover mysterious new classes of galaxies that appear dust-poor in visible light pictures, but actually contain huge quantities of dust.</p> <p>The project has already finished its first statistical dust census of 15,000 galaxies, finding that some contain far more dust and some far less than predicted –&nbsp;and has released catalogues and maps covering almost half a million galaxies.</p> <p>Among other things, the team has found three new exploding stellar remnants containing lots of dust. Interestingly, said Prof. Gomez, these all contain rapidly rotating neutron stars resulting from massive star explosions, hinting that these may be important dust-producing systems.</p> <p>Furthermore, by using the Herschel data to peer back 12 billion years to the early universe, her team found initial indications that the universe may have been much dustier in the past than today and thus characterised by faster star formation.</p> <p>Prof. Gomez says possible explanations for today’s missing dust include galactic winds blowing large volumes out of galaxies or destruction by shockwaves of hot gas.</p> <p>‘These are exactly the kinds of things we should be able to test once the large surveys have been analysed and our catalogues and measurements are finished,’ she said.</p> <p>The researchers are also aiming to resolve a long-standing controversy over the origin of cosmic dust, said Prof. Gomez – ‘whether it is made by sun-like stars in their quiet death throes, or if it is much more violent, instead originating from massive stars that tear themselves apart at the end of their lives.’&nbsp;Scientific research is currently leaning towards the latter explanation, she added.</p> <p><strong>Lab dust</strong></p> <p>Another initiative, NANOCOSMOS, is modelling cosmic dust in the laboratory to build a better picture of how it forms and behaves. Several experimental set-ups have been built to do this, such as the stardust chamber, which simulates the formation of dust grains.</p> <p>Researchers at the Institute of Fundamental Physics (IFF) in Madrid, Spain are currently using this vacuum chamber to investigate the reaction of individual elements found in dust, looking initially at carbon clusters and their interaction with hydrogen. They will later investigate interactions and dust properties involving silicon, iron and other metals, and their interaction with gases, to simulate more realistic astrophysical environments.</p> <p>‘Studying how dust particles form and how they interact with the gas are essential to understand their properties,’ said Professor José Cernicharo, a physicist working in the field of molecular astrophysics at the IFF and corresponding principal investigator for the NANOCOSMOS project. ‘Deriving the structure of the first nanoparticles formed from different elements is a mandatory step to model correctly the physics and chemistry of the ejecta of red giants and supernovas.’</p> <p>Understanding more about nanoparticle formation&nbsp;does not just help uncover what is happening in space and track the universe’s history. Models showing how dust forms and grows can also aid innovation on our own planet in areas such as nanotechnology – important in fields such as green energy and biotechnology.</p> <p>As for the cosmos, investigating dust will ultimately help us form a fuller picture of the universe around us.</p> <p>‘Dust plays a key role in the physical and chemical evolution of astronomical objects, but cannot be properly considered in models because of our limited knowledge on its nature and properties,’ said Prof. Cernicharo. ‘Any progress on this question will therefore have a strong impact in astrophysics and astrochemistry.’</p> <p><em>The research in this article was funded by the EU. If you liked this article, please consider sharing it on social media.</em></p> <br /> <img src=”http://www.google-analytics.com/collect?v=1&tid=UA-40077089-1&cid=cosmic-dustpedias-could-reveal-new-types-of-galaxy&t=event&ec=republish&ea=read&el=cosmic-dustpedias-could-reveal-new-types-of-galaxy&cs=republish&cm=republish&cn=republish&cm1=1" /> This post <a href="https://horizon-magazine.eu/article/cosmic-dustpedias-could-reveal-new-types-galaxy.html">Cosmic &#039;dustpedias&#039; could reveal new types of galaxy</a> was originally published on <a href="https://horizon-magazine.eu/">Horizon: the EU Research &amp; Innovation magazine | European Commission</a>.